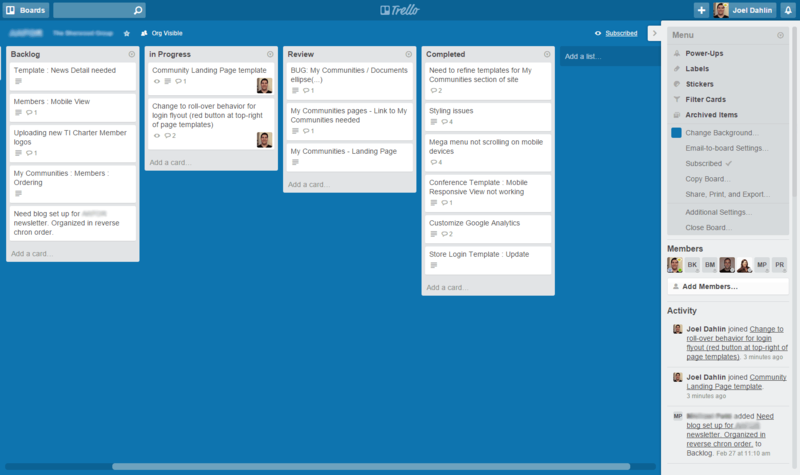 Here is the basic approach in which we use Trello to manage projects. I am going to go over our approach on the Trello board which is always for a specific project. We often will have multiple boards for an organization if there are multiple projects we're working on for them. We often invite our clients to the Trello boards. We find it works well for them to be able to submit cards that need to be done and for them to see progress on their project(s). Here is a look at one of our boards. Backlog - this is a list of all cards (or tasks) that need to be completed for the project. In Progress - this list quickly shows cards that are currently being worked on. Review - these cards have been completed and need to be reviewed by the client to make sure it meets the requirements. Completed - Cards that have been completed. The four lists make it simple and easy to view the progress of the project at a glance. A new card is created by members on the Trello board and always placed initially in the Backlog list. We review the card and if we have any questions we place them in the comments. Sometimes a card will require a deeper discussion over the phone. If that happens we then summarize the details from the call in the comments of the card. Cards are ordered in priority in the Backlog list. When someone begins to work on a card it is moved by the member working on the card to the In Progress list and the member assigns the card to themself. This makes it easily viewable that the card is currently being worked on and by whom. Once the member believes they have completed the card they move it to the Review list. If there is someone specific that should review it a comment is added directed to the @member to review the card. Members who have the say can check to make sure all requirements of the card are are met. If the card meets the requirements the reviewer then moves the card to the Completed list. We also remove all members from the card in this list because if a member wants to view all cards assigned to them to work on they're not seeing completed cards. Title : We like the titles of the card to be short and concise. Typically following a name convention like "What that card is about : What is to be done" ie. 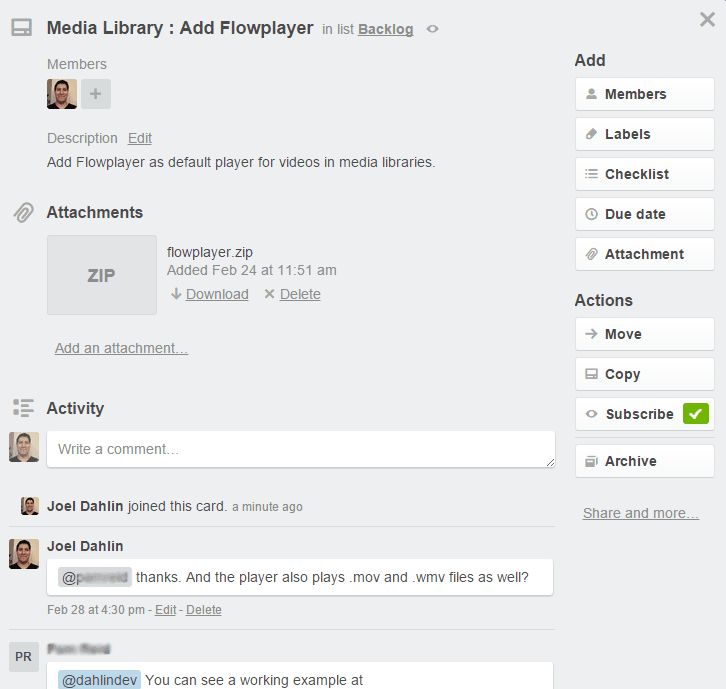 "Media Library : Add Flowplayer"
Description : Here is where all details of the task is placed. The more descriptive the better. Urls to pages that should be worked on is nice vs something like "the link section". We work with many clients and on many projects so we forget the details of every site. The more details the better. Attachments : If there are any assets needed for the card or screenshots to help describe the task they can be added to the card. Activity : here is where comments and discussion of the card is to be placed. Using the @[members name] directs the comment to a specific member. That is pretty much what we use. We rarely use the Due date, Labels or Checklists. I can see how Labels would be nice to help prioritize things, maybe Red = Needs to be done, Green = Nice to have, etc. We are not fond of checklists because it feels like you're trying to put many tasks into one card where we like to have one card = one task. Since we use Trello as our task manager a card should be a task, something that can be worked on and completed. It may be something a developer needs to build, a designer needs to design, an editor needs to add content for, a project manager to retrieve logins for, etc, etc. Cards are not to be used to ask questions. Creating a new card titled "When will development of the store begin?" This is not something that can be worked on. This is something that should be asked via slack, email, Skype or phone. Statements should not be used to make a new card. "We would like to begin testing the site on April 1st." This again belongs in another medium. Creating a new card to comment on an existing card should not be done. Place comments to cards within the existing card under Activity. If you're heavily into the project it is wise to subscribe to the trello board. This can be done in the board view under the menu on the right side of the menu. If you're not heavy into the project but are involved in one of the cards, you can subscribe specifically to that card. By subscribing to the board or card you will receive notifications on the activity of the card(s). We really like Trello. Without it we would be completely lost. We're able to manage our entire team workload over all of our clients with a free version of Trello. That is pretty amazing. We love having our clients join. Often there is some resistance at first and some training is required but eventually it really works well. If you're using #slack there is a great Trello integration. Make sure to set it up. If you're just starting to think about using Trello please signup through my referral link, https://trello.com/dahlindev/recommend. Trello can be used in many, many ways, this is how we use it. Do you have a different use case scenario or approach? Share with us how you use it in the comments. After I published this article we had a client read it and give a good suggestion. We're going to label cards with the yellow label that are at a standstill waiting on feedback or assets. We hope this helps prevent cards from being forgotten about. Hi Joel - Nice article! In addition to the subscriptions, can I mention a Trello add-on - Trellup (http://trellup.com/blog/using-trellup-with-your-trello-boards)? It lets you send out summary emails of your boards, filtering out which lists you want to go out. Handy time saver for letting people know what's happening in your boards, without them needing to log into Trello or even have an account to see it all, and only gives them a summary email instead of a constant stream of notifications. Ive found it helpful to turn on card numbers with this bookmarklet: http://www.trello.org/bookmarklet.html?name=Show%20Card%20Numbers&desc=Show%20card%20numbers%20on%20the%20front%20of%20the%20card&js=(function()%7B%24(%22.card-short-id%22).removeClass(%22hide%22)%7D)() another handy integration is time tracking: http://www.punchti.me/. Im all for keeping features to a minimum but burndown charts would be a cool as well. Thanks for sharing Joe.